Tate Modern today unveils the inaugural Hyundai Commission in the Turbine Hall by Abraham Cruzvillegas. The first in a new series of annual site-specific commissions by renowned international artists, Empty Lot is a large new sculpture provoking questions about the city and nature, as well as wider ideas of chance, change, and hope. 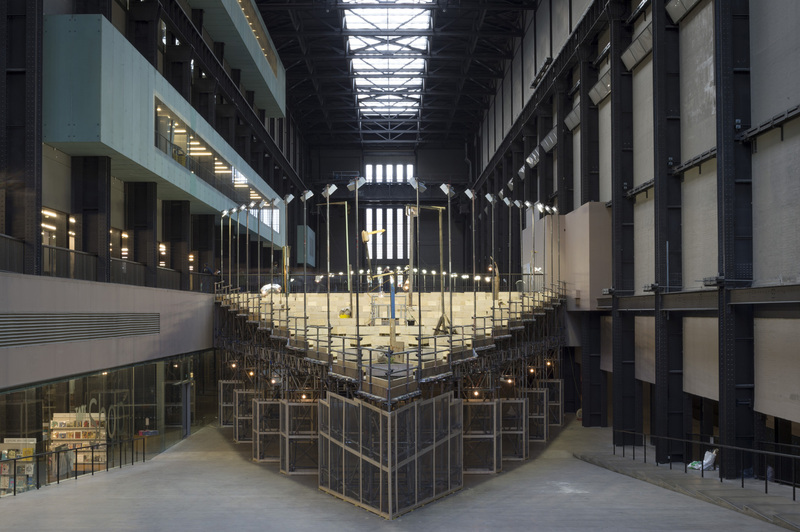 The sculpture consists of two stepped triangular platforms that extend across Tate Modern’s iconic Turbine Hall. Visitors will be able to explore underneath the platforms by wandering through the supporting scaffolding and view them from above on the Turbine Hall bridge. 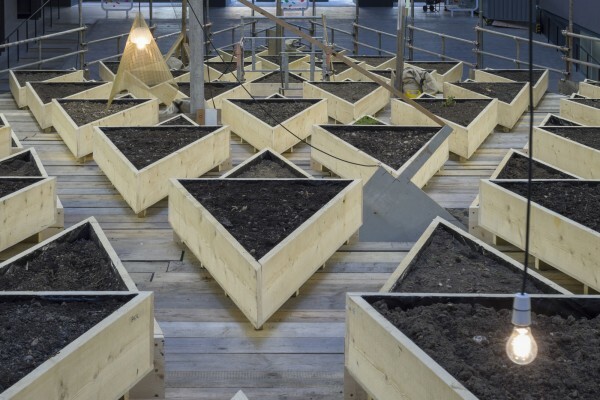 The platforms hold a geometric grid of 240 wooden planters filled with compost and over 23 tonnes of soil collected from parks and gardens all across London from Peckham Rye to Regent’s Park. Abraham Cruzvillegas, Empty Lot, Turbine Hall, Tate Modern. Abraham Cruzvillegas is best known for creating sculptural works from local objects, some found, some bought. 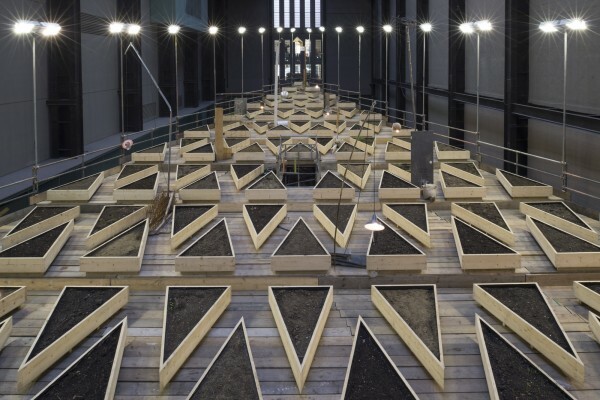 For the duration of the project, the soil will be lit by lampposts constructed by the artist using materials found in skips and building sites around Tate. Nothing has been planted by the artist, but flowers, mushrooms, and other greenery may grow depending on what seeds or bulbs have found their way into the soil. Cruzvillegas explores ideas of unpredictability and hope, inviting visitors to see the sculpture changing from one week to the next. In the middle of a busy commercial area of London, the ‘empty lot’ is a space where nothing is produced but where change might happen. During the 1990s and 2000s, Cruzvillegas was among the key figures of a new wave of artists in Mexico. For the past few years, he has created a body of work under the title ‘Autoconstrucción’ or ‘self-construction’, a term which usually refers to the way Mexicans of his parents’ generation arriving in the capital from rural areas in the 1960s, built their own houses in stages, improvising with whatever materials they could source. Cruzvillegas was born in 1968 in Mexico City, where he continues to live and work. He is represented in several major museum collections, including Tate and MoMA, New York, and in recent years his work has been exhibited at Haus der Kunst, Munich (2014); Walker Art Center, Minneapolis (2013); and Modern Art Oxford (2011). 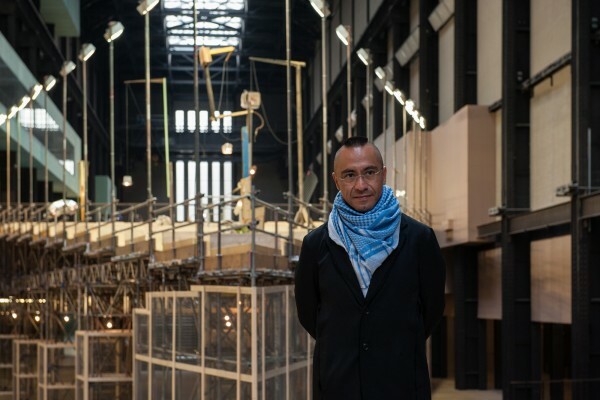 The Hyundai Commission: Abraham Cruzvillegas is curated by Mark Godfrey, Senior Curator, Tate Modern, with Fiontán Moran, Assistant Curator, Tate Modern.